A test for a preventable form of heart disease is being rolled out in the UK. The DNA blood test aims to spot the one in 500 people in the UK who have familial hypercholesterolaemia (FH), an inherited condition that greatly increases a person's heart attack risk. Left undiagnosed, up to half of people with FH will develop heart disease before they are 60. Early treatment can bring risk down to a normal level. People with FH inherit a gene that causes high levels of "bad" cholesterol (LDL) in the blood. This can lead to hardening of the arteries and an increased risk of heart disease if left untreated. A DNA test can check for the presence of the faulty gene. When people are diagnosed, their family should also be offered testing. If one person is found with FH, on average half their brothers and sisters and half their children will also have the faulty gene and be at high risk of early heart disease. The British Heart Foundation is funding £1m to pay for nurses so that testing can be extended to eight NHS trusts across England and Scotland, after a successful pilot scheme in Wales. Some parts of the UK, such as the East of England, will not have access to nearby testing services, however. Prof Steve Humphries, of the British Heart Foundaton, said: "With an estimated one in 200 families carrying an FH-causing faulty gene in the UK, the introduction of cascade testing represents a huge opportunity to identify and treat people before they suffer from potentially life-threatening heart problems." 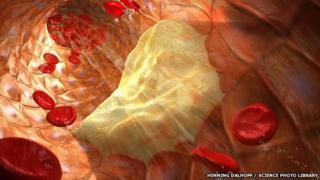 Heart UK, The Cholesterol Charity, urged NHS England to launch a national FH testing service.